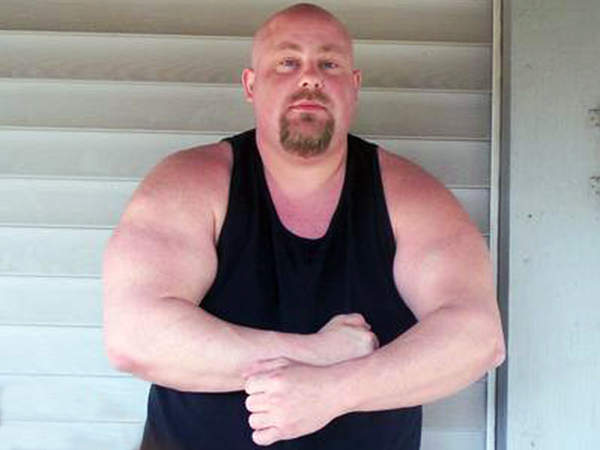 A New Jersey man who bills himself as a fitness trainer is facing federal charges for allegedly selling human growth hormone and anabolic steroids online. Eric C. Opitz, 47, of Phillipsburg, is accused of marketing the drugs to body builders and athletes for unapproved performance enhancement purposes. Prosecutors said the self-described body building consultant, known as “Guru” within local athletic communities, was first prescribed HGH in September 2010, supposedly for the treatment of pituitary dwarfism. While those with the condition suffer growth problems, failing to reach five feet in height by adulthood, Opitz is 6-feet-3 inches tall and weighs about 450 pounds, prosecutors noted in an indictment filed in U.S. District Court Sept. 30 and unsealed Wednesday. Obtaining numerous prescriptions from various doctors, Opitz eventually received a daily dose of HGH about 40 times that recommended by the U.S. Food and Drug Administration, the indictment states. He allegedly sold the HGH to buyers across the United States, advertising it through Craigslist posts in which he touted its “pharmaceutical grade” and advised customers the drug could help them “get bigger and stronger, leaner and harder,” according to court documents. Prosecutors said he typically charged about $450 for each growth hormone kit and directed buyers to send payment by wire transfer. He allegedly offered anabolic steroids, for which he also obtained prescriptions, for an additional fee. Opitz, who describes himself in social media profiles as a gym owner, massage therapist and competitive arm wrestler, is not a licensed physician and does not have the medical training required to distribute the drugs, prosecutors said. He is further accused of falsely claiming Social Security benefits to be his sole source of monthly income in order to use Medicare Part D subsidies to obtain the HGH and steroids free of charge. Medicare paid more than $540,000 for the medications between January 2011 and this past June, according to the indictment. Opitz is charged with 10 counts of health care fraud, four counts of distribution of human growth hormone, and three counts each of distribution of controlled substances and mail fraud. If convicted, he faces what prosecutors described as “a substantial term of imprisonment” and is subject to criminal forfeiture proceedings. Greenbelt, Maryland - A federal grand jury indicted Chandan Manansingh, age 36, of Las Vegas, Nevada, today on charges of selling misbranded drugs with the intent to defraud or mislead, and mail fraud. Manansingh is a criminal defense attorney practicing in Nevada. The indictment was announced by United States Attorney for the District of Maryland Rod J. Rosenstein and Special Agent in Charge Antoinette V. Henry of the U.S. Food & Drug Administration (FDA), Office of Criminal Investigations. According to the four-count indictment, Manansingh owned and operated two companies: Purepeptides LLC (“Purepeptides”), a company through which he sold injectable drugs to individual consumers seeking to enhance their physiques, and Propeptides LLC (“Propeptides”), a company that he falsely represented to be a research institution. Purepeptides advertised on the internet through a company website. According to the indictment, Manansingh advertised the Purepeptides website and products extensively in bodybuilding magazines and sold his products to bodybuilders for their personal use. The internet advertisements claimed that the drugs would, among other things, increase muscle mass, reduce body fat, strengthen the immune system, increase sexual desire and function, induce skin tanning, and reduce skin wrinkling. The drugs that Manansingh sold through Purepeptides included Melanotan II, Growth Hormone Releasing Hormone (“CJC-1295”), Growth Hormone Releasing Peptide-6 (“GHRP-6”), myostatin propeptide, and mechano growth factor (“MGF”). These drugs were not approved by the FDA for use in humans. The indictment alleges that between April 2007 and November 2009, Manansingh induced research chemical suppliers to sell the drugs to him by falsely stating that he operated a grant-funded research institution, used the drugs for research purposes, and did not resell the drugs. After receiving drugs from the suppliers, the indictment alleges that Manansingh would re-package, re-label, and resell the drugs for profit, without medical supervision, to individual consumers who injected themselves with the drugs. The indictment alleges that upon receiving payment from customers, Manansingh shipped the drugs via the U.S. mail to customers around the country. The indictment further alleges that Manansingh advised his customers, via e-mail and telephone, on how to self-administer the drugs, including dosages and placement of the injections, to produce the desired bodily enhancements. Manansingh also told customers that he had personally benefitted from the drugs. According to the indictment Manansingh caused the Purepeptides website to display numerous disclaimers stating that the products sold were for research purposes only and were “not intended for use to affect the structure or any function of the body of man or other animals.” Manansingh allegedly sold the products in injectable vials that were labeled, “For Research Use Only.” The indictment alleges that Manansingh knowingly used these disclaimers to deceive the suppliers and to avoid FDA scrutiny. The indictment also seeks forfeiture of $807,274.75, alleged to be the value of the proceeds of the crime. Manansingh faces a maximum sentence of 20 years in prison for mail fraud, and three years in prison for selling misbranded drugs with intent to defraud or mislead. No court appearance has been scheduled. United States Attorney Rod J. Rosenstein praised the FDA Office of Criminal Investigations for its work in the investigation. Mr. Rosenstein thanked Assistant United States Attorney Robert K. Hur, who is prosecuting the case. BOISE – U.S. Attorney Wendy J. Olson announced today that Bodybuilding.com, LLC, and Jeremy DeLuca and Ryan DeLuca, both of Eagle, Idaho, received criminal fines totaling $8.1 million for violating the Food, Drug and Cosmetic Act (FDCA). The company and the DeLucas were charged with misdemeanor counts of introduction and delivery for introduction of misbranded drugs into interstate commerce. The three defendants appeared this afternoon before Chief U.S. District Judge B. Lynn Winmill in United States District Court in Boise. Bodybuilding.com, LLC was fined $7 million, the maximum possible fine. Under federal sentencing law, corporations convicted of violating the Food, Drug and Cosmetic Act can be fined up to twice the gross gain from sales of the misbranded product. Bodybuilding.com, LLC had gross gain of $3.5 million from misbranded prohormone products, including those specifically identified in the plea agreement. In addition, Judge Winmill ordered Bodybuilding.com, LLC to serve four years’ probation and to implement a product testing procedure recommended by both parties. Jeremy DeLuca, 33, the former president and vice president of Bodybuilding.com, LLC, was fined $600,000; $100,000 for each of the misdemeanor counts to which he pled guilty. Ryan DeLuca, 34, the company’s founder and CEO, was fined $500,000. Judge Winmill also ordered both defendants to serve three years’ probation. The defendants’ fines are to be paid in monthly installments during the period of probation. According to their plea agreements, the defendants admitted that they sold five products misbranded as dietary supplements, when they were actually drugs. The five products – I Force Methadrol, Nutra Costal D-Stianozol, I Force Dymethazine, Rage RV5, and Genetic Edge Technologies (GET) SUS500 – were drugs because they contained synthetic anabolic steroids or synthetic chemical “clones” of anabolic steroids that were not dietary supplements, and because they were labeled and promoted as products intended to affect the structure and function of the human body (building muscle mass). Under the Food, Drug and Cosmetic Act, an individual in a business who has responsibility and authority either to prevent or correct a violation of the FDCA is strictly liable for a misdemeanor criminal violation of the Act, regardless of the extent of his knowledge of the violations. The DeLucas admit that during the time period charged, they had authority over products offered for sale on the company's webstore. Court documents show that during 2008 and 2009, an FDA compliance officer at Bodybuilding.com informed the DeLucas that some of Bodybuilding.com, LLC’s products contained ingredients that did not qualify as dietary ingredients. Court records show that in the first seven and one-half months of 2009, Bodybuilding.com had gross revenue of almost $1.8 million from the sale of products similar to the five products the DeLucas and Bodybuilding.com admitted were improperly sold as dietary supplements. According to the FDCA, “dietary supplements” must contain one or more “dietary ingredients.” A “dietary ingredient” is a vitamin; a mineral; an herb or other botanical; an amino acid; a dietary substance for use by man to supplement the diet by increasing total dietary intake; or a concentrate, metabolite, constituent, extract, or combination of one or more of these dietary ingredients. Bodybuilding.com, LLC, is the largest internet retailer of supplements in the world. It does not manufacture dietary supplements, but only retails products made by others. Olson said that today’s sentencings are the end result of a detailed and thorough investigation that included the execution of search warrants in September 2009 at Bodybuilding.com, LLC's Boise warehouse and Meridian headquarters. “Today's sentencing should serve as a reminder and deterrent to those involved in the distribution of products promoted as ‘dietary supplements’ that the FDA-Office of Criminal Investigations will continue working with U.S. Attorneys' Offices to protect consumers, vigorously pursuing and holding accountable those who sell unsafe and illegal products to the unsuspecting public,” said Lisa Malinowski, Acting Special Agent in Charge, FDA-Office of Criminal Investigations, Los Angeles Field Office.